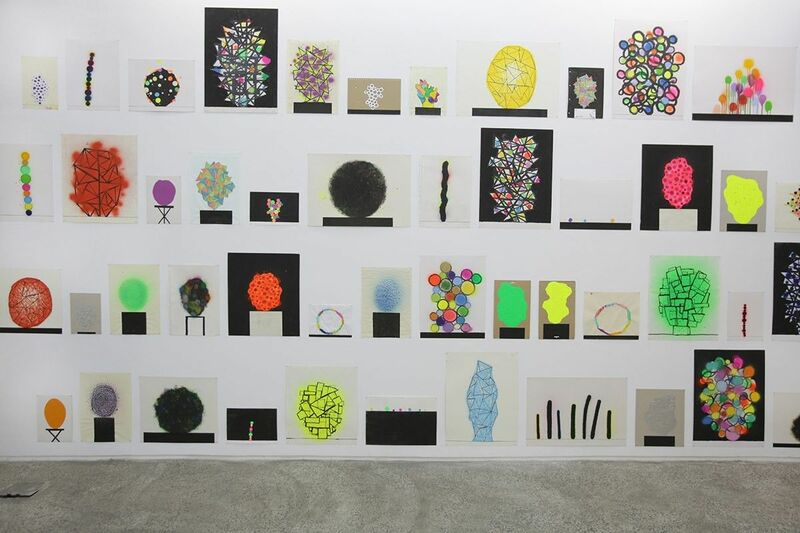 Chromatology presents David Batchelor’s first solo exhibition in Tehran comprising an overview of the Scottish artist’s and writer’s work, including sculpture, drawing, painting, photography and installation. While he is most known for his illuminated light boxes, industrial dollies and other found objects, the artist has made colour his leitmotif for the past twenty years. Batchelor takes interest in the synthetic kind of colour that occurs in the metropolis rather than the kind of natural and subdued tones found in nature. It is the stark, artificial, industrial and petrochemical qualities found in the built environment that inform his practice and manifest into various works. shards of glass inserted into them. These came directly out of his interest in the almost global convention where broken bottles are inserted into wet concrete to keep away from trespassers. The intimate size of these sculptures gives the broken glass a jewel like quality enhancing the vivid colour of the shards of glass. Drawings and paintings lie at the core of Batchelor’s practice. As if extracted from his studio, a room of Atomic Drawings displayed at Ab-Anbar brings together over a hundred works on paper, with an array of mediums including highlighter, industrial tape, ink and spray paint. The Colour Chart Paintings also explore relationships between form and colour as well as the two dimensional versus the three dimensional. The exhibition also includes Batchelor’s photographs of Found Monochromes, 1997-2017, shown recently at the Whitechapel Gallery, London, which are a growing series of photographs of white rectangles found in the urban environment. Bachelor has explained his fascination as following, ‘ A monochrome is always situated somewhere between the mystery of an infinite void and the ordinary materiality of a flat surface.’ Informed by a number of cities including London, Paris, Sao Paolo and Tehran, they are found voids and pauses in the never-ending feast of visual information. Batchelor has written a number of books, including the Luminous Grey (2014), Found Monochromes (2010) and Chromophobia (2000), a book on colour and the fear of of it from the Euro-American perspective, which is being published in farsi by Ab-Anbar. David Batchelor (b. Dundee 1955) is an internationally renowned British artist, writer and Professor in Fine Art at Goldsmith University in London. His work is present in many international collections, including Tate, London and his work has been shown in numerous museums world wide. Shiny Dirty, Ikon Gallery, Birmingham (2004); the 26th Bienal De São Paulo (2004) Sodium and Asphalt, Museo Tamayo, Mexico City (2003); and Days Like These, Tate Britain Triennial of Contemporary Art, Tate Britain, London (2003). The exhibition has been curated by Leyla Fakhr (born 1979, Isfahan), who works as an independent curator and producer. She is the founder of Art Square Projects, an agency that develops contemporary art projects with special focus on Public Art. She recently produced ‘Monir’, a documentary directed by Bahman Kiarostami on life and work on the artist Monir Shahroudy Farmanfarmaian. Previously, she worked at Tate, London (2007-2015) where she contributed to the acquisitions and exhibitions of British art as well as art from the Middle Eastand North Africa. She was the recipient for the Abraaj Capital Art Prize with the artist Nazgol Ansarinia (2009) and awarded the International Curators Invitational from Fondation d’Entreprise Ricard, Paris (2006).